Custom window graphics and installations for your business. Large or small, take advantage of your window space. Glass is an excellent surface whether you want to provide a subtle image, simple information or a bold statement. 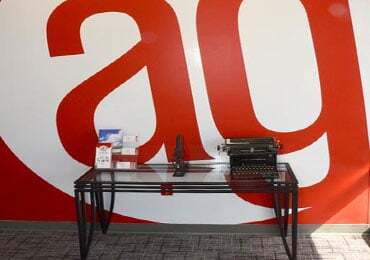 We have solutions for interior and exterior window graphic applications. Our window graphic solutions include clear window decals, die-cut decals, perforated vinyl, static window clings, store window lettering, vinyl window decals and more. Choose from solid to clear, one sided and see-through graphics with permanent or reusable adhesives. 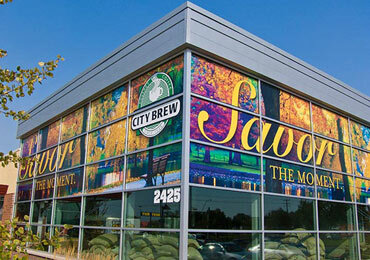 Large or small window applications include product showcasing, branding, sales, contact information and more. Ensure your graphics are properly secured to receive maximum visibility. We offer complete window graphic installation services and site surveys. Whether you need an interior or exterior installation for your graphics, we have the expertise to get the job done right. Window graphics can be applied on a temporary or permanent basis, on interior or exterior surfaces. Need a custom graphic to cover your business’s windows but don’t know where to start? Our talented creative team can help you bring your project to life. From start to finish, we’ll work with you to create something that will help you and your business get noticed. We are ready to partner with you on your next project.